Tag line: "How do you save yourself when you're already dead?" What does it mean to be dead? 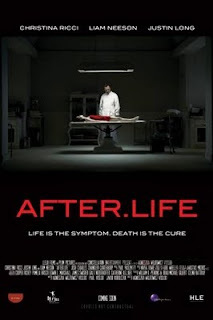 That’s the question at the heart of writer / director Agnieszka Wojtowicz-Vosloo’s 2009 film After.Life, a horror / mystery that occasionally misses the mark, but gives you plenty to think about. Following a fight with her boyfriend Paul (Justin Long), school teacher Anna (Christina Ricci) hops into her car and speeds away. Moments after she leaves, she’s involved in a terrible car accident, and is pronounced dead before she reaches the hospital. Her body is transferred to the local funeral home, which is owned and operated by Eliot Deacon (Liam Neeson). As it turns out, Eliot is especially suited for his job; he can talk to the deceased! As he tends to Anna’s body, she seemingly wakes up, asking what has happened. Eliot informs her that she’s dead. As expected, Anna doesn’t believe him, and over the course of several days she tries to escape from the morgue, all the while wondering why she doesn’t have a pulse, and can no longer feel pain. As Anna struggles with her situation, a grief-stricken Paul is just as unwilling to accept that the woman he loves is gone forever. When Eliot prevents him from seeing Anna’s body (because he isn’t family), Paul does everything he can, including going to the police, to gain access to the morgue. All the while, he experiences visions of Anna, leading him to believe she may be reaching out for help. Is Anna truly gone, or is she being held against her will? The story is an intriguing one: a man who can communicate with the recently deceased, trying to convince a young woman that her time on this earth is at an end. It’s a fascinating enough topic on its own, but After.Life gives us a bit more as well by building a mystery to go along with it: is Anna actually dead (we get our answer well before the finale)? While the pace of the movie is definitely on the slow side (the majority of the film is set in the morgue, and is dialogue heavy), the premise alone was enough to keep my interest piqued for the duration. Unfortunately, a side story involving Jack (Chandler Canterbury), one of Anna’s students and a young boy who seems to share Eliot’s connection with the dead, left some loose ends that undermined its effectiveness. For instance, there are allusions early on that Jack is being bullied at school (Anna enters her classroom one morning and finds two kids pushing him around). Is he an outcast because of what Eliot would call his “gift”? Worse still are the few scenes between Jack and his mother, who we only ever see from the back (she spends all of her time in front of the television). Because this mother / son relationship is never fully explored (is his mom dead, or merely wasting her life? ), any sort of deeper meaning we’re expected to take from it (including how it might figure into the dilemma that Anna is facing) falls by the wayside. As for the performances, they may not be career-bests for either Ricci or Neeson, but what might be perceived as their “passionless” turns do, in fact, fit their characters to a T (Ricci’s Anna is a depressed young woman dealing with her own demise, and Neeson conveys both the underlying warmth and the emotional detachment one would expect to find in a funeral director). Still, the best of the bunch is Justin Long as Paul, the grieving boyfriend whose insistence that Anna is alive could very well be his way of coping with guilt (he is, after all, the reason she drove away that fateful night). But there might also be more to it than that (his visions of Anna have him wondering if she’s really dead). Obviously, I can’t reveal the final twist in After.Life, but I can tell you that it caused me to think a little about my own life and whether or not I’m living it to the fullest. This is something most people contemplate at one point or another, especially when dealing with the death of a close relative or even a casual acquaintance; when my time comes, will I be satisfied with what I’ve accomplished? The tragic reality is that many would answer “no”. That’s my answer right now, anyway. So what am I going to do about it? It’s not often a movie, especially a flawed one, will inspire such reflection, but that’s the effect After.Life had on me. And since I’m fairly certain that’s what Wojtowicz-Vosloo was aiming for, I’d have to say that, even with its failings, After.Life gets its point across rather well. Damn. I'll look for this one. I rather liked THE BLACKCOAT'S DAUGHTER that you reviewed. I'll see if this one is worth watching.